Wow! I just realized it’s been over a month since I’ve posted anything – Happy Belated New Year!! Lots of things happening, but not much time to write about it all, let’s see if I can recap a little bit. 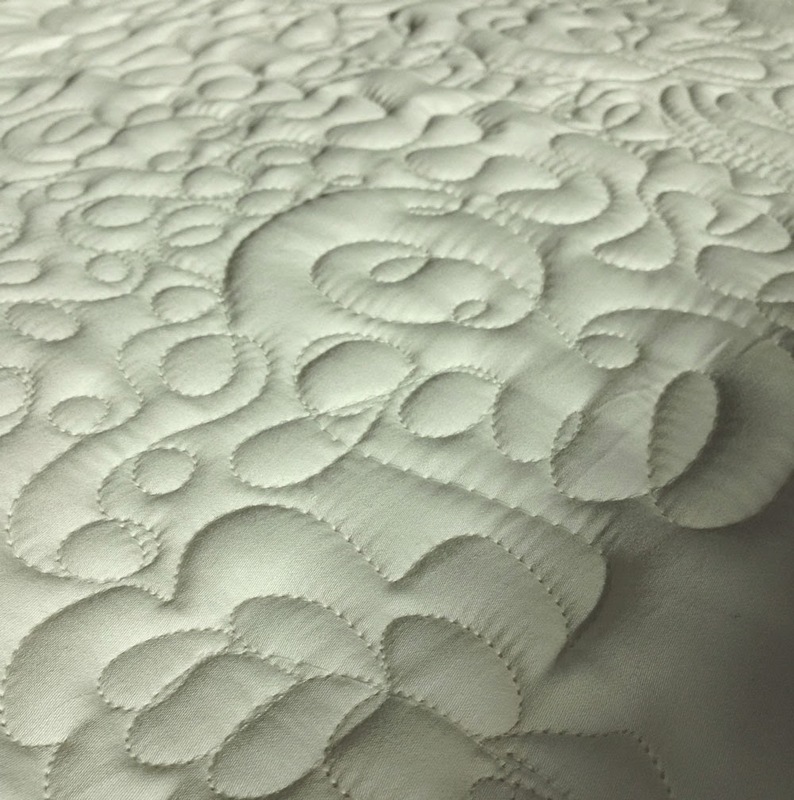 One great thing I’ve been able to do this month was go to Just Quilting for a longarm class with Nancy Stovall. What fun, I loved it completely. Now that I have a class under my belt, I can rent time on the machine whenever I have a quilt top/back finished!! Sam Hunter put together a pretty quilt top for charity, and when I said I wanted to practice on the longarm some more, she promptly handed me a bag with that top, a back, batting and pre-made binding in it and said I could use it for practice! FANTASTIC – Thank you! 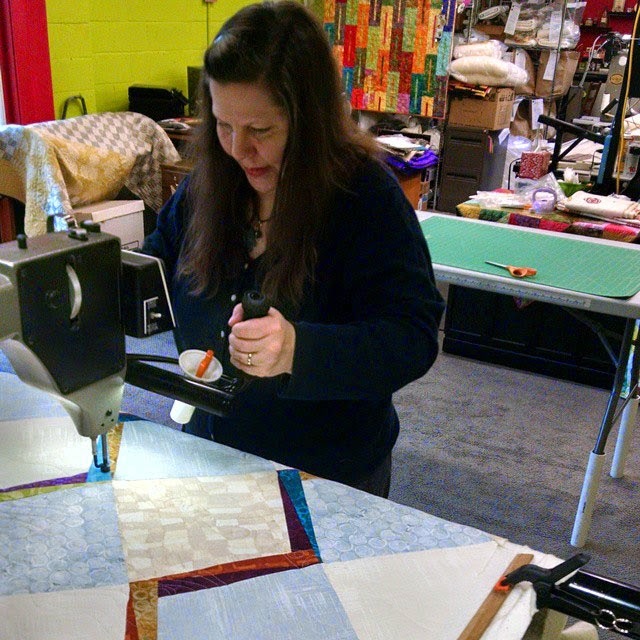 So I went back to Nancy’s studio last week and worked on an actual quilt. I got the whole thing quilted in my 2 hours on the machine. I had so much fun! One thing that is a little daunting is picking a pattern to use. This particular quilt was one that my husband was really attracted to, and while I was thinking of doing an all-over floral pattern, I thought that might be too ‘girly’, so I changed my mind and took an idea from Christina Camelli’s new book: Step By Step: Free Motion Quilting. I came home after doing this quilting with a million new ideas in my head for quilt designs and patterns that would lend well to longarm quilting… hopefully I can get rolling on those soon. Another HUGE thing that happened this month was that my little brother has contacted me! My mom & dad had just found out they were pregnant for the 5th time right before I was kicked out/left home. So, after all these years, I had never talked to him. Fast forward to two weeks ago and I get a message on Facebook that just says: “Hey Sister”. That was it… I responded right away, and we have been in contact everyday since!! He has also left the Jehovah’s Witnesses, and the family is no longer speaking to him either… so we really connected. He is 27 now and is in a whirlwind of emotions. He lives in CA, and he has plans to come visit within the next few months – SO EXCITING! 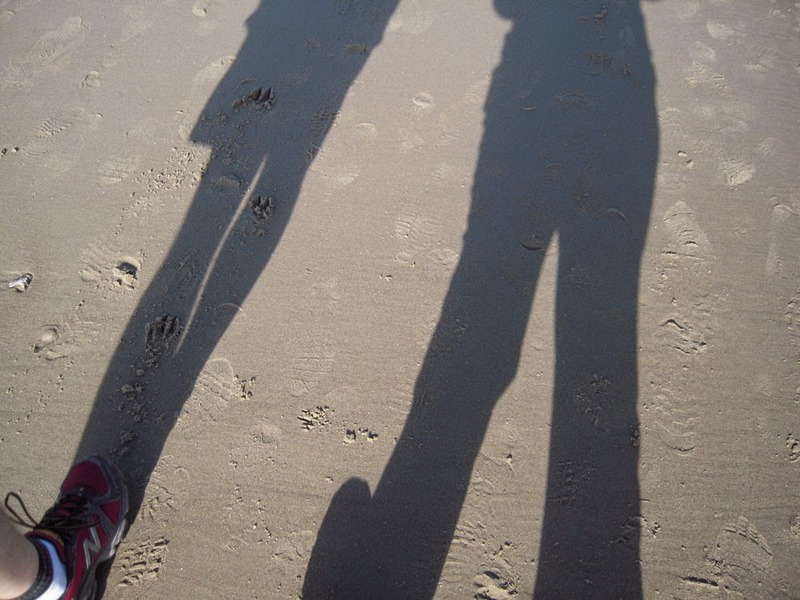 It seems like it could almost be like reconnecting with a child you gave up for adoption… I don’t know… but it’s strange (to say the least) to get to know a stranger (basically) who shares the same parents. It’s kind of neat to find similarities between us, and I’m elated that I now have a bit of my family back. Last week was my birthday… and we got to go to the coast out by Cannon Beach for the weekend. It was a long-needed break, I don’t think Gregg and I have taken 3 days off together in at least 5 years! The best thing was that it was above 60 degrees and super sunny! At night the sky was so clear you could almost touch the stars… and they came all the way down to meet he waves on the horizon. Just beautiful! 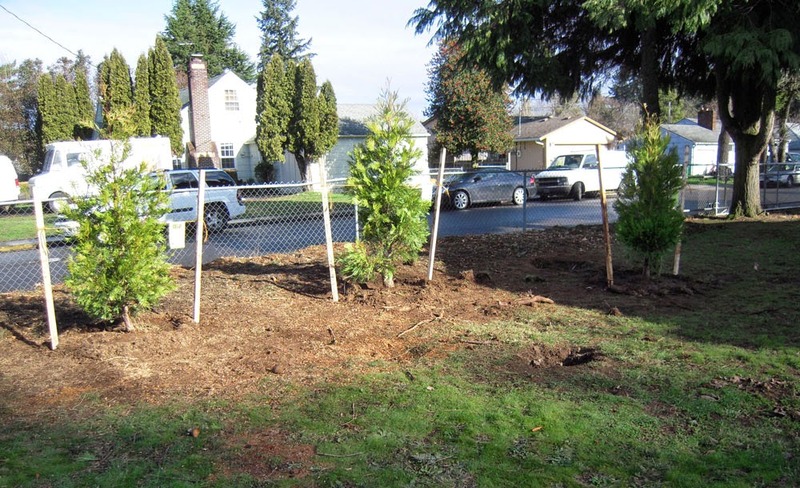 …and we also got our 3 new trees! They are incense cedars to replace the big firs we recently had to take down. They are so cute and green – and they help fill the yard and that makes me happy. I’m still working on the quilting of the Jellyfish – right now I have about a quarter of the “water” left to quilt… and then I’ll be ready to add a few more French knots before putting the binding on. I’m planning to hand sew the binding too so I can say the whole quilt is hand stitched! There are a few more projects currently on my plate right now, I’ll tell you about them in the next post. What will you be working on next month? Wow — big news indeed! I am so happy for you that you have connected with your brother. It must be wonderful to have that connection after what must have been a painful family split. Happy Belated Birthday, too! Glad that you could celebrate with your hubby over a beautiful beach weekend. 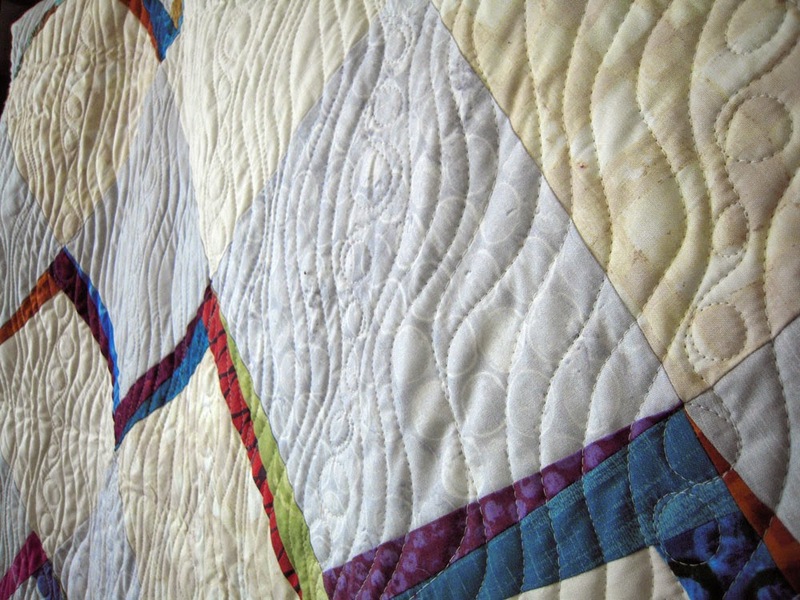 Looking forward to seeing your next quilt finishes . . .